A neutron star is the equivalent of half a million Earths squeezed into a sphere only 15 kilometres in diameter. In October 2010, one such star near the centre of our galaxy erupted with hundreds of X-ray bursts powered by a barrage of thermonuclear explosions on its surface. NASA's Rossi X-ray Timing Explorer (RXTE) captured the month-long display in extreme detail. An international team of astronomers has been able to use this data to bridge a long-standing gap between theory and observation. "In a single month from this unique system, we have identified behaviour not seen in observations of nearly 100 bursting neutron stars during the past 30 years," said Manuel Linares, a postdoctoral researcher at the Kavli Institute for Astrophysics and Space Research at the Massachusetts Institute of Technology in Cambridge. He led a study of the RXTE data that will be published in the March 20 issue of The Astrophysical Journal. On 10 Oct 2010, the European Space Agency's INTEGRAL satellite detected a transient X-ray source in the direction of Terzan 5, a globular star cluster about 25,000 light-years away toward the constellation Sagittarius. The object, dubbed IGR J17480-2446, is classed as a low-mass X-ray binary system, in which the neutron star orbits a star much like the sun and draws a stream of matter from it. As only the second bright X-ray source to be found in the cluster, Linares and his colleagues shortened its moniker to T5X2. Three days after the source's discovery, RXTE targeted T5X2 and detected regular pulses in its emission, indicating that the object was a pulsar — a type of neutron star that emits electromagnetic energy at periodic intervals. The object's powerful magnetic field directs infalling gas onto the star's magnetic poles, producing hot spots that rotate with the neutron star and give rise to X-ray pulses. At NASA's Goddard Space Flight Center in Greenbelt, Md., RXTE scientists Tod Strohmayer and Craig Markwardt showed that T5X2 spins at a sedate — for neutron stars — rate of 11 times a second. And because the pulsar's orbital motion imparts small but regular changes in the pulse frequency, they showed that the pulsar and its sun-like companion revolve around each other every 21 hours. That same day, RXTE observed its first burst from the system: an intense spike in X-rays lasting nearly 3 minutes and caused by a thermonuclear explosion on the neutron star's surface. Ultimately, RXTE cataloged some 400 events like this between Oct 13 and Nov 19, with additional bursts observed by INTEGRAL and NASA's Swift and Chandra observatories. NASA decommissioned RXTE on Jan. 5, 2012. In the T5X2 system, matter streams from the sun-like star to the neutron star, a process called accretion. 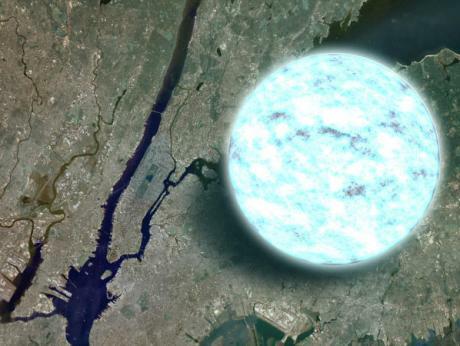 Because a neutron star packs more than the sun's mass into a sphere between 10 and 15 miles across -- about the size of Manhattan or the District of Columbia -- its surface gravity is extremely high. The gas rains onto the pulsar's surface with incredible force and ultimately coats the neutron star in a layer of hydrogen and helium fuel. When the layer builds to a certain depth, the fuel undergoes a runaway thermonuclear reaction and explodes, creating intense X-ray spikes detected by RXTE and other spacecraft. The bigger the blast, the more intense its X-ray emission. "We see T5X2 as a 'model burster,' the one that's doing everything expected of it," said Diego Altamirano, an astrophysicist at the University of Amsterdam in The Netherlands and a co-author on the paper describing the findings. The question now before the team is why this system is so different from all others studied in previous decades. Linares suspects that T5X2's slow rotation may hold the key. Faster rotation would introduce friction between the neutron star's surface and its fuel layers, and this frictional heat may be sufficient to alter the rate of nuclear burning in all other bursting neutron stars previously studied.